Everybody knows that New York and Boston have an intense rivalry, but few know just how deep this hatred goes. It’s not about Yankees and Red Sox or Jets and Patriots (though I hate both Boston teams with an eternal passion). It’s about history, religion, war, culture, and of course, money. This article (Parts One and Two) will only go from the Colonial Era to just before the Civil War. There’s simply too much to cover, and the Civil War becomes way too complicated and dense to properly discuss on a blog. For further reading, I suggest Gotham, by Burrows and Wallace, to start. It’s very comprehensive. A works cited list will appear at the end of Part Two. At points I will link to a Wikipedia article or post pictures as an aside, but I used very little wiki for information. It’s usually accurate, but not always. The rivalry begins well before The United States existed. While Boston and the Northeast of modern America was colonized by Puritan English, New York—then called New Netherland–was colonized by the Dutch, with New Amsterdam as its main city. New England and New Netherland conflicted on many different levels. New England was a religious colony, refugees from a persecuted minority. New Netherland was founded by the Dutch West India Company, and was always a mercantile colony foremost. New Netherland showed more leniency toward different religions (despite Peter Stuyvesant’s attempts against it), and a substantial population of Huguenots, Quakers, and Calvinists settled along the Hudson River. In New Amsterdam, the official religion was Dutch Reformed, but citizens were allowed to practice other religions in private. We all famously know what that would get you in New England (See Salem Witch Trials). England and The Netherlands were fierce competitors for many reasons far beyond the scope of this article. The two nations engaged in a series of wars, known appropriately as the Anglo-Dutch Wars. The first war ended in a stalemate, but the English would not rest. New England colonists continued to press into New Netherland territory from Connecticut. These “Yankees” (a disparaging name for the New Englanders derived from the Dutch “Jan Kee,” meaning “Little Jack,” though other sources say it came from “Jan Kaas,” or “Jack Cheese) first took the eastern half of Long Island. They moved westward, taking the modern boroughs of Queens and Brooklyn, before finally capturing New Amsterdam. The valued port came under the dominion of Boston. The taking of New Amsterdam directly led to the Second Anglo-Dutch War. 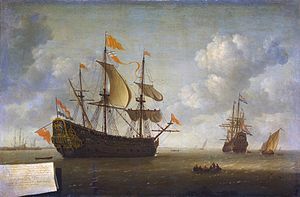 This war was a Dutch victory (at one point the Dutch fleet sailed up the Thames, sunk three English Man o’ Wars, and towed away the Royal Charles, the English flagship. Despite the victory, the Dutch agreed to give up New Netherland and focus its interests south. New Netherland and New Amsterdam were renamed New York, after James Stuart, Duke of York and eventual King James II. As such, the great rivalry began as pawns within a greater chess game. The rift would only grow. The two great hotbeds of the American Revolution were Philadelphia and Boston. Most people know that the first shots of the Revolution came at the towns of Lexington and Concord, not far from Boston. Lesser known is that the Massachusetts Minutemen were able to drive the English from Boston Harbor, using artillery captured in the Battle of Fort Ticonderoga. This was a great victory for the patriot cause, and a humiliation that the English would not suffer without retribution. New York was not quite as lucky or patriotic. Because of its commercial ties to England, many wealthy New Yorkers were unwilling to revolt. Called “Tories,” or “Kingsmen,” they created an ambivalent attitude that the English took advantage of. After their defeat in Boston, the English fleet landed in New York. They overwhelmed the patriots at the Battle of Long Island (Battle of Brooklyn). Washington was forced to withdraw from the city, and England gained an excellent home base for their excursions. New York has one of the finest natural harbors in the world, and the Hudson River (then called The North River) is an estuary that large ships can sail on well into the colony’s interior. Much of England’s strategy in the early war was to split the colonies by taking all of the Hudson. They failed due to several reasons, such as the various chains along the Hudson, and the Patriots ability to harry the better trained and equipped English. The plan ultimately failed at the Battle of Saratoga, one of the most important battles of the Revolution. In addition to being the English army’s headquarters, NYC was the site of some of the worst atrocities of the war. 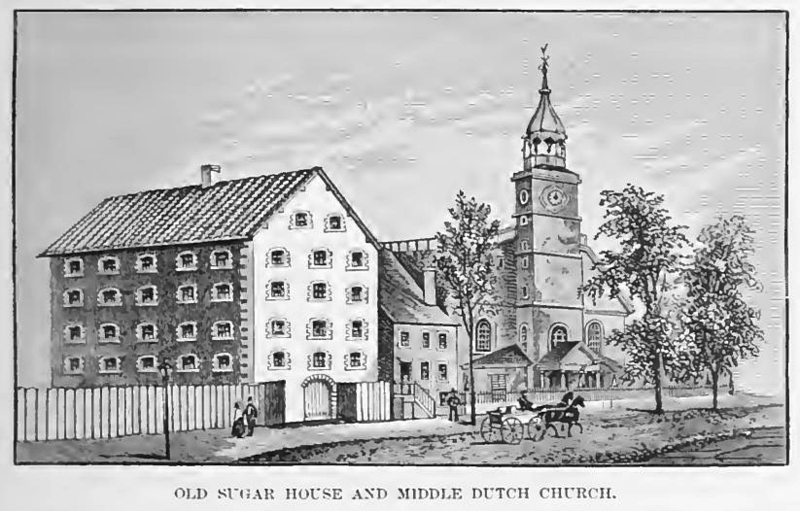 Captured Continental soldiers were stored like cattle in Provost’s Guard, as well as prison ships in the harbor, churches, and warehouses like the Liberty Street “Sugar House” owned by the Livingstons’. 11,500 soldiers died in captivity of malnutrition, infection, and diseases like Dysentery. In order to keep this article readable, I’m going to break it into two parts. Part Two will deal with economic and culture clashes leading just up to The Civil War. Come back soon. Like my posts? Follow my website or “Like” my facebook fan page and/or follow me on Twitter. You can also purchase my debut novel, Song of Simon, at any online bookstore or a real one (you’ll probably have to order it). Of course, you can always buy an autographed one from me, just send me a message. Song of Simon currently has a 4.7/5.0 rating on Amazon, so people seem to like it. Boston is certainly slaughtering New York in the sports rivalry. They’ve had a good run the last 20 years, but I think NY still has the advantage…then again, NYC has 2 baseball teams (formerly 3), 2 football teams, 2 basketball teams, and 2 hockey teams.